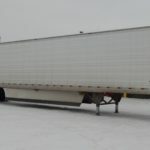 Refrigerated Van Trailer - Kingpin Trailers LTD.
Side Sheets Flat 0.040″, pre-painted white aluminum side sheet. Side Posts Extruded aluminum “Z” side posts on 12″ centers nose through support gear and 24″ centers support gear to rear of trailer. Roof One-piece 0.032″ thick aluminum, tension leveled prior to installation. Special corrugated roof sheet design allows roof to expand and contract without foam delamination or structural weakening of roof. Front Wall Stainless steel front impact plate and pre-painted 0.040″ white aluminum sheets with 6.00″ radius. Large opening refrigeration unit bracing. Rear Doors Extruded aluminum frame type swing doors with dual durometer seals and 0.040″ pre-painted white aluminum outer sheets. One easy-operating anti-rack lock rod per rear door. Lockrod handles are fitted with rubber grips for operator comfort and safety. Four heavy-duty extruded aluminum hinges per door are provided. Lining Sides: 0.065″ Versitex VR2. Insulation Injection foamed urethane insulation. Sides, floor and roofing 2″ thick. Rear door 3″ thick. Front wall 4″ thick. Crossmembers Five inch deep extruded aluminum I-beams on 12″ centers from the end of the upper running gear rails to the support gear. Three inch deep hi-tensile aluminum I-beam cross members on 12″ centers between the upper coupler and support gear. 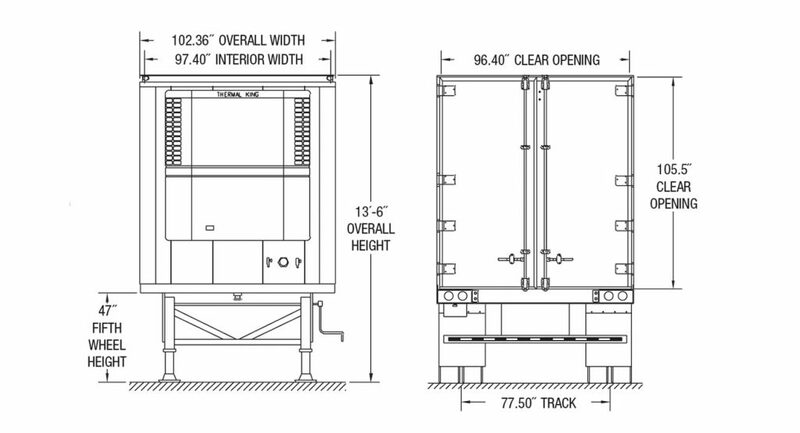 Four inch steel, 80,000# yield I-beams on 12″ centers over the support gear and the upper running gear rails. 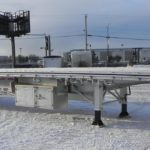 Two additional I-beams are added in the last 4′ of the trailer for additional impact resistance to severe loading conditions. Upper Coupler Four inch deep with stainless steel front approach apron. A 1/4′ thick approach plate and 1/4′ thick top and bottom main beam plates. King pin is A.A.R. rated. Floor Extruded aluminum 1-1/4″ high duct type. Rear gutter is flush with top of floor. Last 4′ of floor is reinforced for fork lift use with extruded aluminum inserts and a 43″ deep × 96″ wide composite bearing sheet. Two inch deep Apitong hardwood floor sills. Landing Gear Two speed, 50,000 lb. capacity, A.A.R. rated with 10″×10″ sand shoes. Roadside crank handle. Hot dipped galvanized mounting bracket and bracing. Wheels Steel hub piloted disc wheels 22.5″×8.25″ with outboard mounted brake drums. Brakes Non-asbestos lining 16.5″×7″ quick change type, “S” cam operated automatic slack adjuster. 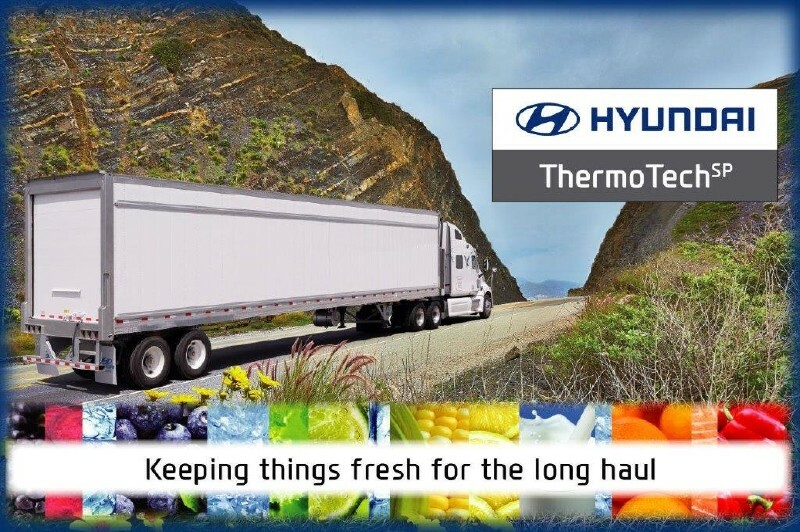 Hyundai’s refrigerated van trailer has a 98.4″ interior for wide loads and use the leading insulating compounds on the market.